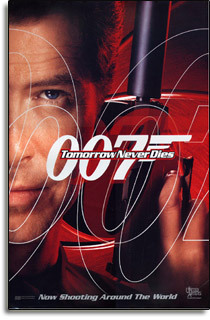 When I first reviewed Tomorrow Never Dies in 1997, I said that it was a great action movie that failed as a Bond movie. More than a decade later that statement still rings true. The film starts off promisingly enough with one of the best pretitle sequences of the series. It has a bit of everything: Bond disobeying M’s orders, humor, great action and even a campy yet not too absurd ending with 007 ejecting his “backseat driver” into an enemy MiG. It continues with the sinking of the HMS Devonshire, which also provides many classic Bondian moments. Elliott Carver is revealed only in sinister shadows and Stamper cruelly assassinates the 17 Devonshire’s survivors in the water in order to provide Carver with his headline. The Stealth Boat and Sea Drill are fantastic gadgets worthy of the greatest of Bond villains and, as a whole, the sequence has a very Bond feel to it. The problem with the movie, however, is that Bondian scenes such as these are few and far between and very unevenly paced. For example, soon after the wonderful Devonshire sequence, the audience is subject to one of the most painful M/Moneypenny sequences in the series, filled with countless terrible sexual puns from both of Bond’s coworkers. Then, while Carver’s CMGN launch party in Germany has the potential to be brilliant, it introduces Teri Hatcher as Paris Carver in a role as cringe worthy as Stacy Sutton in A View to a Kill. This feeling of up and down continues throughout the movie, as Bond’s break-in at Carver’s German CMGN offices is brilliant, but his escape via remote controlled BMW from his hotel does not require any real skill on Bond’s part other than some fancy finger work. That said, it’s an amazing action sequence and one of the more fun car chase sequences in the series: but it’s not Bond as he should be. Later, Bond finds himself forced to team up with Wai Lin, a spy for the Chinese Security Force, and the latest in a long line of Bond Girls meant to be equals with 007. While I do believe that a Bond movie needs a strong Bond Girl, my stance has always been that this should not be at the expense of James Bond himself. In this case, the last third of the film truly becomes a Bond and Wai Lin movie, as evidenced by the studio’s failed attempt to give Wai Lin her own franchise. My dislike for Wai Lin is not helped by the fact that the majority of her scenes in the movie are amongst my least favorite. She just gets in Bond’s way during his investigation of the wreck of the Devonshire, she is thoroughly annoying during the BMW bike chase and she yells “yeaaah” every time she shoots a gun. The movie is also weighed down by Jonathon Pryce’s non-menacing portrayal of Elliott Carver. Despite having a relatively realistic scheme, his lack of intimidation abilities makes him perhaps the most forgettable villain in the series. The few scenes where intended to show his cruelty (describing Kaufman’s torture techniques and mocking Wai Lin’s karate) come across as unbelievable. Even his death is forgettable; how did he not hear the giant Sea Drill coming across the entire room before it crushed him? As for Stamper, he also started out strong but was reduced to a small afterthought over the rest of the movie. Even his death was pathetic, as he has the dumbest and most incredulous look on his face when Bond outsmarts him. It’s like they ran out of ideas for the character 30 minutes into the film. I could go on and on about my problems with the movie: he use of slow motion was terrible, some of the countdown scenes were worthy of being in an Austin Powers movie, Bond seems to have developed a biting fetish with his female conquests, the action scenes were mostly unbelievable, etc. However, Tomorrow Never Dies still has other many great parts including Bond’s visit with Q, the HALO jump complete with Bond in a Commander’s uniform beforehand, 007 shooting Kaufman in cold blood and the escape from Carver’s Vietnam CMGN office. 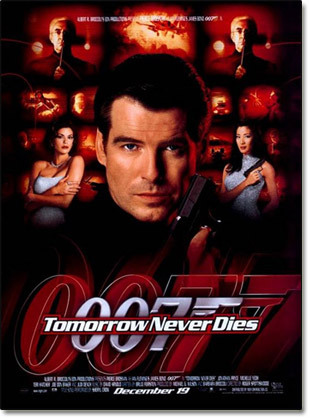 All things said, while it is in no way one of the stronger entries into the James Bond franchise, I would still rather watch Tomorrow Never Dies again rather than some of the other things on TV these days. The original title was Tomorrow Never Lies. The script was not finished at the beginning of filming. Teri Hatcher was three months pregnant when she filmed her scenes. A part of the Q scene was cut in which Q says "Here's your new car," opens a box with a live jaguar in it and says, "oops, wrong crate." Although the scene was deleted, you can still see the crate with the jaguar in the background.